This is an afternoon tea I’ve been wanting to try for some time now. Part of me was scared that it might not be great and then I’d have the lovely Alison & Tim Hayward (not forgetting Liberty!) 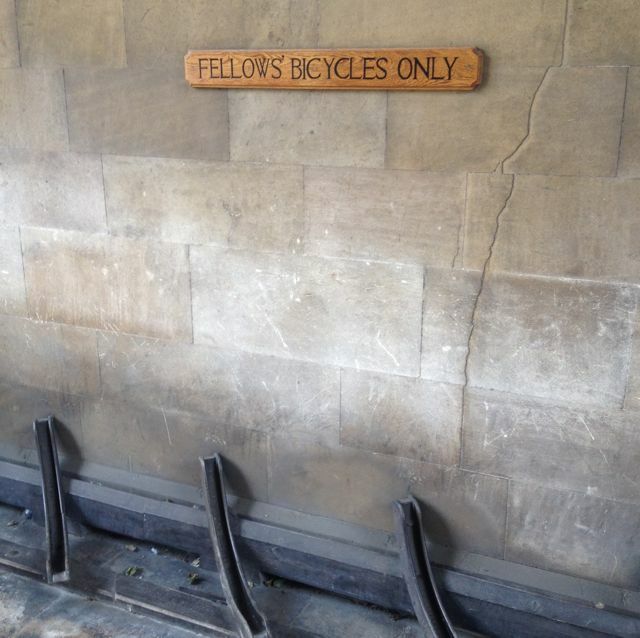 to answer to – as well as most of the Fitzbillies team of whom I always love bumping into across the city. I’ve known Tim from my very early afternoon tea and blogging days, we sat on the same table at a pop-up bloggers conference in London where he spoke with advice as a speaker one day around 5 years ago. That day was the day that Tim gave me some of the best writing advice I’ve ever been given. He told me to blog or write as I would speak to a friend over a pint in the pub, that there’s no harm in writing in a chatty style if that’s how I want it to be – to this day I still mutter to myself as I type – heck, I’m doing it right now in the middle of his Cambridge Bakery – I probably look like a nutter, but I don’t care do care a little bit! 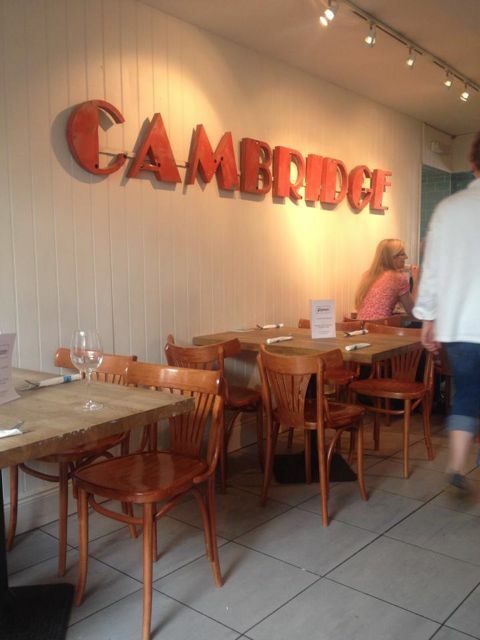 But, I’ve also not yet reviewed Fitzbillies because when I’m passing this iconic Cambridge bakery, I always struggle to find a table to perch on – the sign of a truly great place to eat of course. These guys also serve Kandula Tea (the very same tea I used to serve within my own afternoon tea events back in the day) so that’s always a winning formula for me from the start. Anyone who dares to mess with the classic grated cheese finger sandwich, adding a tomato relish to it is a brave afternoon tea vendor indeed. But do you know, it is one of the standout elements for me on this tier, a real surprise to a tomato hater at any other time. The classic rectangular finger sandwiches are a good size, allowing 3-4 mighty mouthfuls with fillings such as a plain egg mayonnaise, ham & mustard and a salmon & cream cheese. The fresh bread has wholemeal grains running through and if these pinkie sandwiches had been pre-made, they hadn’t dried out or curled, they were perfect. If I had been asked if I’d wanted that sandwich platter replenished I would have screamed yes in a heartbeat. An extra bonus today was that whilst pouring my English Breakfast Tea, I was introduced to Gill Abbs, the head baker at Fitzbillies as she passed my table. Gill has been with the ever-changing Fitzbillies family for almost 43 years (stupidly impressive and inspirational in equal measures) and she smiles widely as she recalls her first days working in the kitchens. She also once worked for Tyler’s Bakery (now the infamous Nadia’s across Cambridge) and The Copper Kettle on Kings Parade overlooking my favourite Cambridge college. This was back in the days of when it was perfectly acceptable to smoke cigarettes in bakeries, she laughed. The scones, unfortunately, didn’t pass the “break test” and crumbled ever so slightly at my finger tips. But, they were light, fluffy, buttery and full of soft fruity flavour in the sultanas within it, so I can just about forgive. There was, however, plenty of strawberry jam and clotted cream and for a real change… I digested the entire scone, fairly quickly too – oops. This meant that I started to fill very quickly and so chose the “Doggy Bag Test” for the miniature cakes on the top tier. 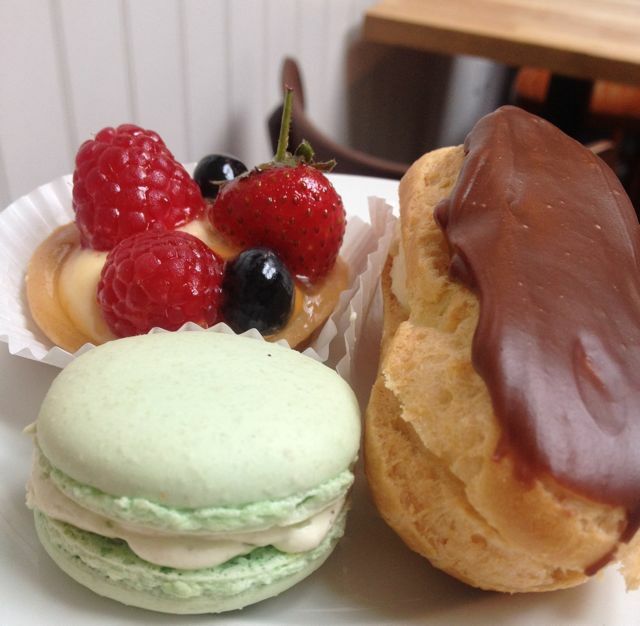 I had a gorgeous fruit & creme patisserie tart, a cream-filled chocolate eclair and a beautiful handmade macaron to nibble on the bus ride home. This was the perfect excuse to test this favourite mini test of mine and enjoy those cakes with a coffee later in the evening on a second wind – parp! The cakes were packed away in a cute white cake box with the trademark blue Fitzbillies stickers to seal them fresh for later, passing the test with flying colours – no cling film or tin foil here. Where were the mini Chelsea Buns?? I really thought (and secretly hoped) that these would be present, but they were nowhere to be seen in any form, a real shame as these would most certainly set this afternoon tea tier apart from the rest. I saw (and smelled, mmmmm) some delicious miniature savoury tarts being carried fresh from the oven to the bakery shop trays. Now, I am really starting to enjoy my savoury elements lately, so one of these could work perfectly for a savoury option. At this price for afternoon tea, I’d expect one miniature savoury option, but that’s my personal opinion of course – oh dear, that smell was divine, those baking devils! I was seated towards the back, by the kitchen and members of staff would go outside to have a cigarette break. No issue with that, other than the smoke was coming back through the open door into my dining area, they may need to move away from here to avoid in future. Getting the chance to chat with Gill from the bakery for 10 minutes was a true highlight, she’s such a lovely lady and our conversation has made me even more appreciative of the history and passion behind Fitzbillies. 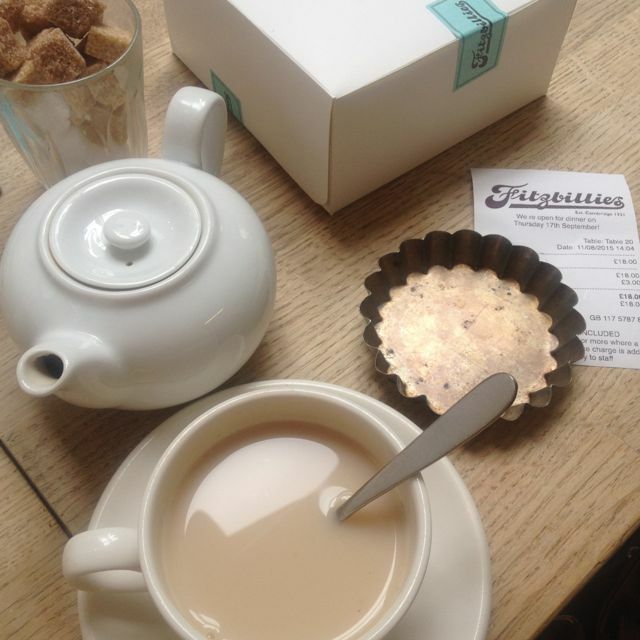 Gill also mentioned that she had trained and worked with Tom from Toms Cakes in St Ives (A fave haunt of mine), so if you’re looking for an independent afternoon tea venue with plenty of local love, Fitzbillies is for you. I also love that I wasn’t rushed, no disturbances from staff asking me if everything was ok every five minutes and a refresh of tea was provided on request for hot water, great service. 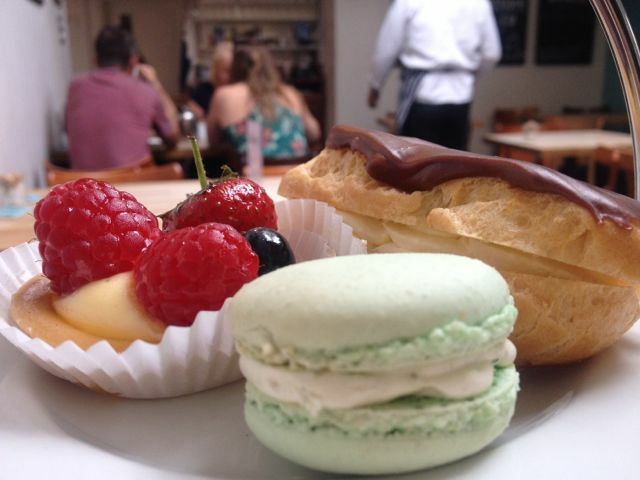 Afternoon Tea at Fitzbillies costs £18 per person or add £5 for some fizz to go alongside. You can buy preserves, biscuits, even their own tailored children’s book to take home with you, great souvenirs for the tourist in you all. Take your time here, you aren’t rushed and you can opt to watch the world go by or study the open plan bakery kitchen towards the back (which I did today) for some fun people watching. This is not a great venue for large groups, so if you’re more than a standard table of people (I’d say more than 6) then do call ahead to book or discuss with the team. 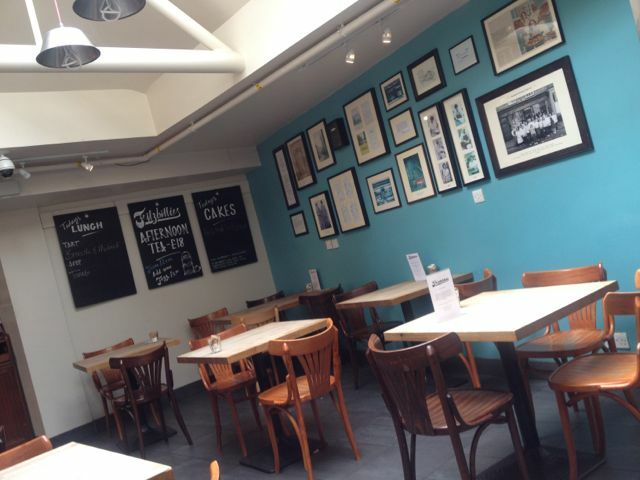 Whilst visiting Cambridge, Fitzbillies is a venue worth popping in for come rain or shine (great place for air con in the shine!) 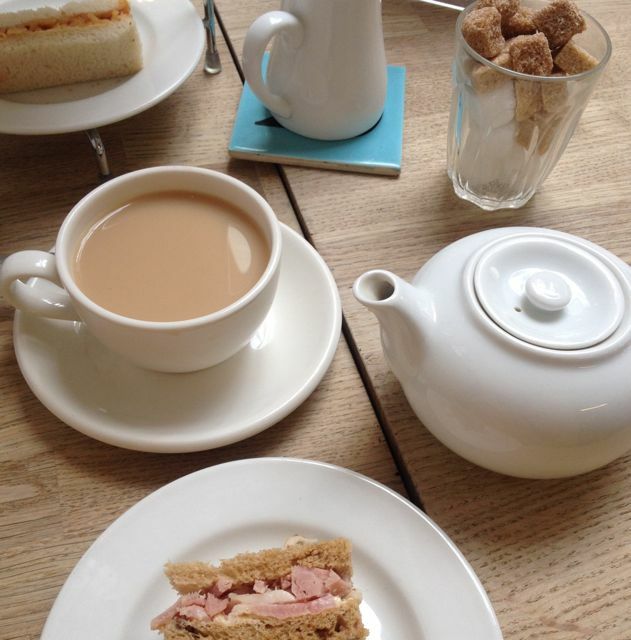 to sample a slice of the Duke of Cambridge cake or a famously sticky Chelsea Bun, if not a full on afternoon tea. Whilst in Cambridge today, I also enjoyed making a little video of my self-date, a good stroll around Cambridge is good for the soul – give it a go yourself! A huge hello to Sally and her kids from the bus (we sat at the from together on the way in haha) and a huge thanks to Max from Scudamores punting for showing off his “board spinning” skills for me for my little video session – Cambridge is such a friendly place, I love it!. 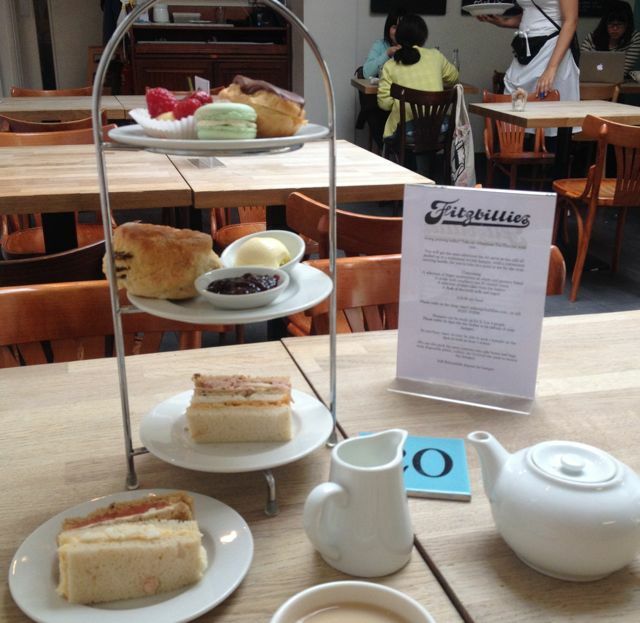 Have you enjoyed afternoon tea or cakey treats at Fitzbillies? 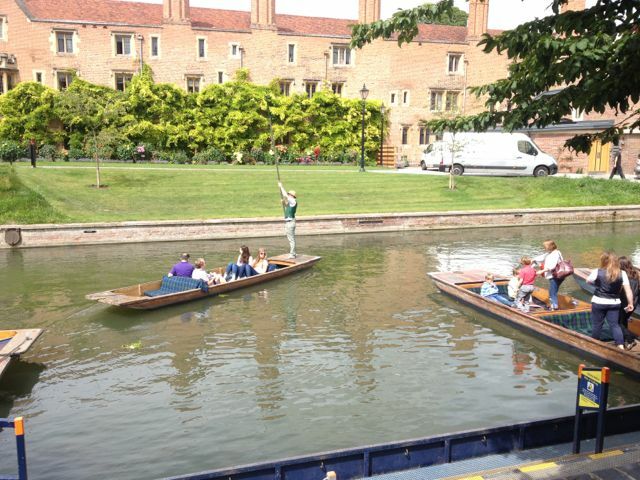 What’s your favourite way to spend a day in Cambridge in your own company? I’d love to hear from you in a comment or through the social media links below. Please note – I paid my way during this visit and I am in no means obliged to blog or write about their offerings, but I simply choose to share with my readers, should I enjoy the experience.